Georgia tailback and leading rusher Isaiah "Shotgun" Crowell was arrested this morning and charged with multiple felonies including carrying a concealed weapon. Don't worry folks Mark Richt will give him a come to Jesus talk. According to Athens-Clarke police spokesperson Hilda Sorrow, Crowell was arrested as the result of as “vehicle check-point stop” — a road block — on East Campus Road at Green Street at 2:20 a.m. Friday. Officer Kristin Thornton reported smelling the odor of marijuana in Crowell’s 2005 Mercury Grand Marquis. Crowell gave consent to search the vehicle, himself and four other unnamed occupants. No marijuana was discovered but a 9-mm Luger handgun with an altered serial number was found under the driver’s seat. Crowell was immediately arrested and taken to jail and the car was impounded. My guess is Crowell will never play another down between the hedges. It seems like every offseason I'm making excuses for one of their tailbacks getting suspended or thrown out of school. Actually it is every offseason. 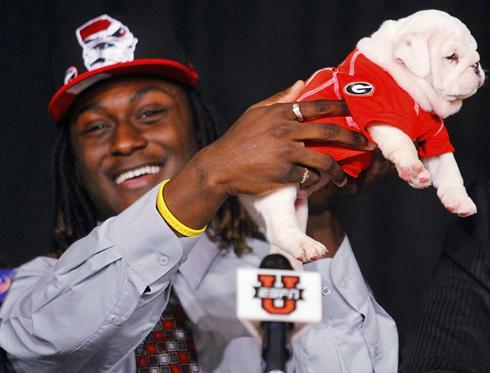 Crowell is just the latest "can't miss" prospect who just couldn't grow up and mature in Athens. It's probably Mike Bobo's fault. Don't worry Georgia fans. You still have freshman Keith Marshall. He won't get in trouble because he is actually a good kid off the field. His skill set is similar to Crowell but he doesn't have quite the size. Marshall is the fastest guy on the team though so he will be fun to watch. Yes that would be a concern for any NBA team. You can't just take a guy like Ohio State forward Jared Sullinger if he suffers from a bad case of bulging dicks.